90 Day Fiance Alums Elizabeth Potthast & Andrei Castravet Are Parents! 90 Day Fiance Alums Elizabeth Potthast and Andrei Castravet are new parents! Just like most other new parents, they shared photos of their newborn on Instagram. Their daughter Eleanor Louise Castravet who was born in late January. In addition to sharing family photos, they also discussed both the joys and challenges that come with new parenthood during a recent interview. Fans may recall their story began when Elizabeth met Andrei in Dublin, Ireland while she was on vacation and Andrei was working as a bouncer. Elizabeth hails from Tampa, Florida while Andrei worked in Ireland but is originally from Chisinau, Moldova. We watched their relationship develop during 90 Day Fiance Season 5, which included periods of tension between Andrei and Elizabeth’s family. They believed Andrei was too controlling of Elizabeth and her father went as far as refusing to offer financial support to the couple. 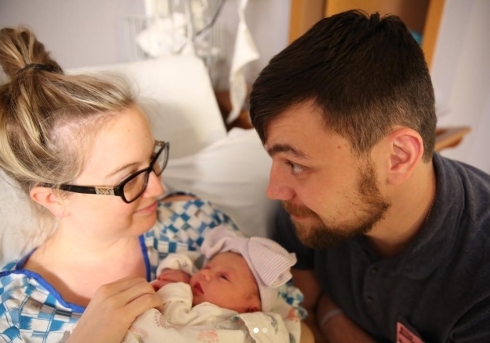 All of that friction seems to have melted away because the couple appears happy and in love with their new bundle of joy Eleanor Louise! Eleanor was born on January 23, 2019, at 6:13 am weighing 6 pounds, 11 ounces. Elizabeth posted on her Instagram account, “We are so pleased to announce the birth of our baby girl!” The three of them are pictured smiling and holding Eleanor in the two photographs. Andrei was quick to follow by posting a photograph on his own Instagram. He told his followers, “I’m a Dad now! Welcome Eleanor to our world!” Fans of the show and the couple commented with congratulatory messages and warm wishes of support. The TLC cameras caught up with the couple for an interview about becoming parents. Holding baby Eleanor, Elizabeth said it was “extremely rewarding to be a first time parent” but that it was “overwhelming at times and tiring. Can we get an “Amen” on that one? Andrei remarked that being a dad is “great and it is amazing having this piece of joy” in their lives. He even sweetly kissed Elizabeth and told her, “So proud of you babe – amazing”. Awww! Elizabeth shared some background on the baby’s first and middle names. They choose “Eleanor” because it is “classy and traditional [and] it means bright and shining one.” They went with “Lousie” for the middle name because it is a “family name” as both she and her mother have that as their middle names. Elizabeth also revealed that she calls her new daughter “Miss Eloise”. Andrei said Eleanor is “very alert, sees and looks everywhere” but also “very calm”. He said, “She doesn’t cry too much or give us trouble”. The couple thanked the 90 Day Fiance fans for their “warm wishes and support” and said they are “very blessed to have this beautiful bundle of joy” and “thank you for following our journey”. Welcome, Eleanor Louise aka Miss Eloise!!! TELL US- DO YOU THINK THE TENSION BETWEEN ELIZABETH’S FAMILY AND ANDREI WILL LESSEN WITH THE NEW BABY? WOULD YOU LIKE TO SEE THEM ON 90 DAY FIANCE: HAPPILY EVER AFTER?